While not a trailer, this accessory for hauling or storing small boats (canoes and kayaks) is a fantastic addition to a trailer. The canoe / kayak rack is designed to be set up and used, or folded up and set aside. Use it to store boats — either on or off the trailer — then to haul the boats to the water. If you travel with canoes or kayaks, this is a great rack! This design is NOT a trailer, just a rack that is great to put on a trailer or use separately for boat storage. Width size options for Canoe rack or a Kayak rack. Folds up to just a few inches thick when not in use. Attach this rack to nearly any utility type trailer. Makes an excellent rack to store boats — On or Off a trailer. Plans include complete drawings and instructions. This nifty boat rack holds up to 6 canoes or kayaks (or any combination). When not in use, the rack comes apart for easy placement out of the way — like to rest flat (against a wall for instance) as shown in the image. Options in the plans show size changes to build it smaller, for use as a kayak rack. To stand alone, usually on the ground or small platform, to hold the boats storage. Bolted to the flat bed of a utility trailer to become a boat hauler. And it’s easy enough to use the same rack for both purposes. 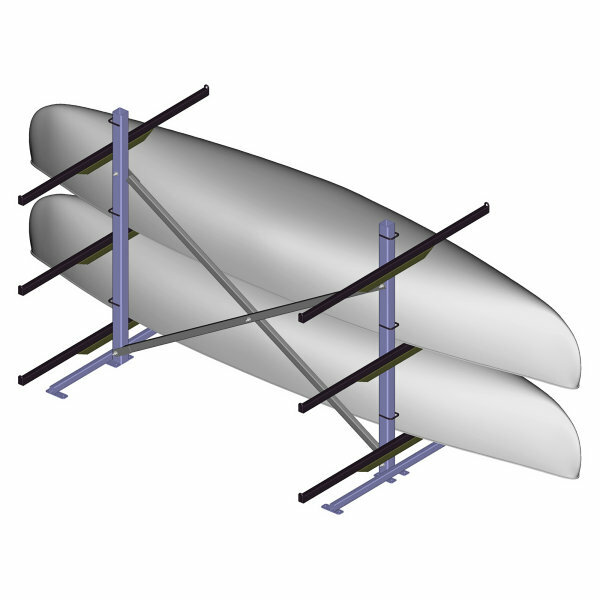 The image shows 2 canoes loaded on one side of the rack. Plans are for the rack only, you supply the boats. This is a simple design that is easy to build. . . . Read more about What is in the Plans . . .
Construction requires metal cutting, drilling, and welding. Great plans are available here!